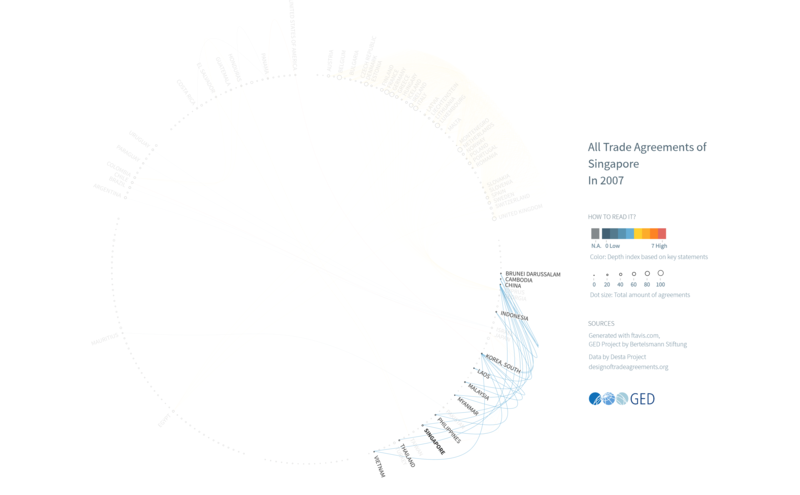 Last week we showed you our new data visualization tool FTA Vis. 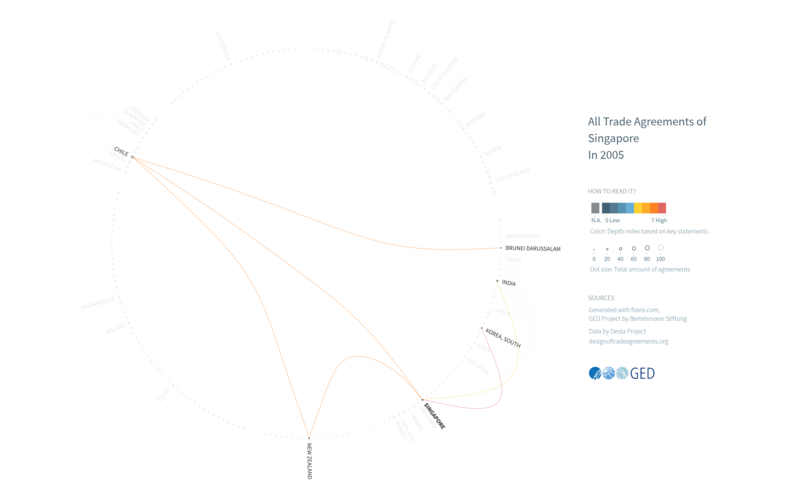 FTA Vis visualizes 789 trade agreements from 205 countries over the last 66 years. And each of these visualizations has its own story to tell. In today’s blogpost we want to tell you one final one of those thousands of stories. This fairly extreme case is interesting because it shows both that the domino effect does not only work through trade diversion, but also because it lets us see that independent historical events are also important to consider in the case of FTAs. First, in East Asia, the “domino effect” played a role in the spread of FTAs, but not only because countries feared trade diversion effects. With NAFTA’s success and the deepening of the European Community, East Asia was mostly worried that it would lose bargaining power in international trade negotiations. This embodies another way through which FTAs spread through a domino effect: by creating regional zones, they encourage the creation of other trade alliances elsewhere that do not want to be left out in the global power game. The proposed Regional Comprehensive Economic Partnership (RCEP) is clearly going in that direction as is the potentially even more comprehensive Free Trade Area of the Asia-Pacific (FTAAP) currently proposed by China. The proliferation of FTAs in East Asia is also an interesting case because it was accelerated by independent events: the 1997 and 2008 financial crises. 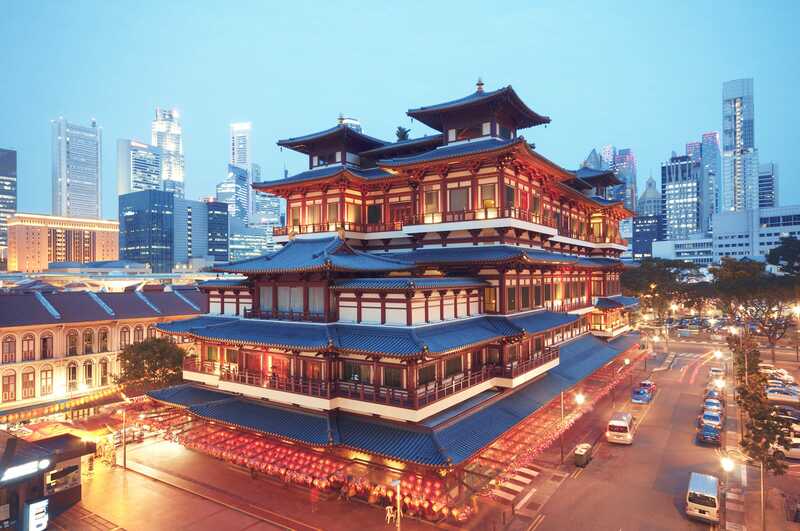 The former indeed “made it clear that Asian economies needed to work together in the area of trade and investment in order to sustain growth and stability by addressing common challenges”, while the latter showed that relying solely on Western markets may not prove a sustainable long-term solution. Not only are there unique reasons for the spread of FTA’s, but also unique problems. Notably, the spread of FTAs in East Asia has been achieved mostly through bilateral agreements, as can be shown by playing FTA Vis. The lack of a unified framework for East Asia has created a unique problem of rule messiness known as “the noodle bowl” as a multitude of overlapping rules of origins (ROOs) raise transaction costs for small and medium-sized businesses. Compared to the multilateral efforts made in Africa, Europe and North America, playing FTA Vis in Asia shows us the composite nature of FTAs, trapped between bilateral agreements and individual deals between the ASEAN community as a whole and non-ASEAN countries. We can exemplify this by looking at Singapore, which signed both, multiple deals with countries in Asia individually but also with the ASEAN community as a whole. Looking at Asia shows us that the global spread of FTAs that started in the mid-1990s shows some common features worldwide (the domino effect notably), but it also may have regional causes and pose specific challenges. Interested in more FTA VIS data stories? Read our last blogposts here and here if you haven’t already! You want to learn how to use FTA VIS? Visit our YouTube Channel for a tutorial video as well as additional data stories.